Published: Oct 6, 2017 to ? A very fun manga, but ultimately serves as a time-passing manga rather than something of substance - at least for now. 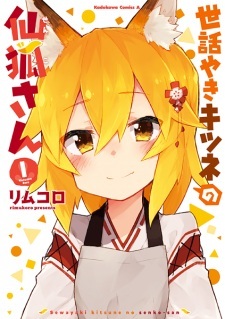 I may update my thoughts on this series as time goes on since there may be an actual plot, but this is the story of a divine fox spirit that takes care of a salary-man as he is terrible at it. While other colourful characters join the cast over time, the manga is very much focused on the two leads. At the time of writing this, only two volumes have been released and while there have been some fun, and some emotional scenes, it is not much more than something to read and then not think about. I think it serves its purpose well, and will continue to read more, but frankly 7/10 is a fair evaluation. This manga is still an excellent slice of life with its quirks, and pretends to be no more. A minor edit: the art uses thick lines and is used quite well for visual storytelling as well. A lot of small details are well polished.